"'Halo' is one of the most impressive video game offerings that I've ever seen. The game is tense, thrilling and downright creepy at times. The game's graphics may not push the XBOX completely, but they're often brilliantly crafted, with worlds and interior environments that I would love to see realized in a film." "We think part of the reason Halo excels is due to the fact that Bungie have thankfully ignored some unwritten rules that have ingrained themselves in FPS titles of the last few years." "This game combines a great plot with amazing gameplay and graphics, to create one of the best first person shooters ever made." There were several ratings that were not taken into account for this review: it was given a 2/5 for its 'Christian' rating, a 2/5 for 'Violence', and a 4/5 for its 'Adult' content (language). The date, as well, is the date this review entered the database; there is nowhere on the site at all that suggests when this review was written or published. "Graphically, Halo is all eye-candy, as long as you don�t use the 10x zoom on the sniper rifle to look at all of the things that no one really cares about." "Simply put, Halo is the best console FPS ever made." "Two words - Absolutely fantastic." "This is by far one of the most appealing titles to play over, and over, and over!" "Everything, ranging from a large variety of texture-maps to well-detailed buildings and environements help pull together a complete visual concept that doesn't deter from the solid gameplay." "In the end, while Halo is a bit of an achievement, it does suffer from far too many drawbacks to deserve all the praise its received." "While the game soars in some aspects, it fails to deliver in others. Overall, a good game, but not all it was hyped up to be months ago. " " This is undeniably the best game you can get for the Xbox (still), and stands as one of the finest shooters ever crafted. " The numerical rating was not part of the original review - it was added for the sake of our inflexible database here. Thanks, Michael! "You really have to play it for hours to really understand the enjoyment it can bring you. " "All in all halo is very solid, but with little innovative or impressive play." "Every console that gets released has a game that is automatically associated with it. Halo is the Xbox game. " "The dynamic score makes you feel as if you are truly on Halo." "This game is a finally tuned war machine. " "Every gamer should make it a point to play this game, as it will be the standard by which all future console FPS games are judged." "There's nothing I really would take points off for.� I was very pleased with the overall gaming experience Halo provided, and I highly recommend it to everyone. � If you don't have it, get it.� It really is that good." "It's only a matter of time before every new FPS tries to call itself a "Halo killer"." " Halo is still one of the greatest games to ever grace a console." "The more I wanted to write and the more I wanted to say, the more I just wanted to stop and go back to wiping the Covenant off the face of Halo. " "Halo is a masterpiece. If you haven't bought this game, you'll have to check this out anyway, as an xbox-owner. Halo is even doing well in Japan. Now if that doesn't say much, I am a grunt. " "The best way to sum up Halo could be by a line Lawrence Fishburne's character, Morpheus, says in 'The Matrix'... 'You need to see it for yourself'." "I am here to tell you this is the best damn first person shooter that has ever hit the shelves for any console or pc, and should be looked at for a game of the year award." "Halo combines all of what has made previous shooters great, mashes it into one package, and releases it on the most powerful system available." "...the AI is so good the enemy can create moments that may never be repeated if you play through the game again. " "The AI, and the long range that most of the fights occur at, give the game the feel of real combat." "For those looking for the ultimate Xbox game we can't recommend it enough." "The more I wanted to write and the more I wanted to say, the more I just wanted to stop and go back to wiping the Covenant off the face of Halo." "Overall Halo is a work of art." "The best console game I have ever played." "It is exactly what�it says on the box - 'Combat Evolved'." "Its missions aren't particularly unique, and can be frustrating for people without much experience playing this style of game. That said, the top-notch audio, smooth graphics, and intriguing story make it the best console FPS to come out in a long time." "In nearly every area Bungie's instant classic expands, refines, polishes and in some cases innovates." "The perfect launch game (the perfect FPS? ), it doesn't get any better than this. Now go out and buy a piece of gaming history - the perfect launch game." "Playing Halo definitely leaves one of those satisfying great game smiles on your face." "Overall I'd say this is one of the best FPS games I have played on a console since Goldeneye and Perfect Dark." "Halo wins the award for the most repetitive game so far on the Xbox"
This game was originally reviewed by this site on March 7, 2002, and given a score of 9.4. This is a revised review. "When you meet the tougher breeds you'll swear they were being controlled by another human, such is the depth of their AI." "In all areas, Halo excels where so many console FPS games fall flat on their faces." 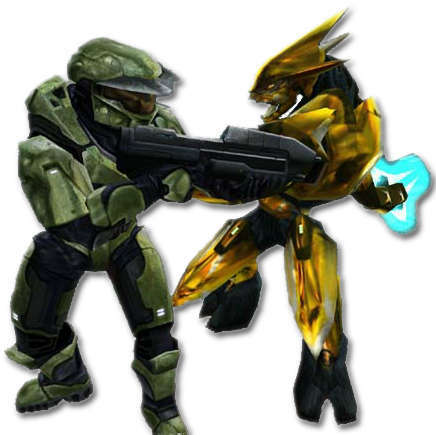 "Halo is a near-perfect combination of sheer action, story and strategic-thinking combined with some excellent AI and great multiplayer action." "Exquisite control, a great single player mode (with co-op!) and a multiplayer that�s good enough to satisfy the most demanding FPS fan have all been polished to within an inch of their lives to deliver this: the best console FPS ever, and one of the top FPSes made, period. " "After playing this game, you will want to strap a machine gun to your dune buggy's crossbar and drive around Blackpool Beach looking for aliens. And so will your best friend!" "Fans of the FPS genre are a finicky bunch. With fierce competition, the PC has always been leaps and bounds above consoles for this type of game... until now." "It shows off the Xbox's true potential and should set the standards for all future FPS. " "The single player is epic, the multiplay the best yet on a console and the asthetics of the sound and vision unbelievable. " "Halo: Combat Evolved probably is going to be the best known Xbox game and there is a reason for that." From the URL supplied by the link above, scroll down to Xbox and select Halo - there's no direct link to the Halo review. "Every living thing moves so realistically that you'll swear you are watching a movie, and, in a sense, you are. "